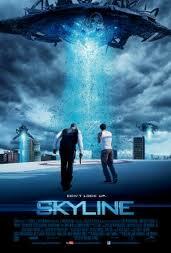 OK, this film is Independence Day meets Fire in the Sky meets Cloverfield meets The Matrix and boy is it boring. LA is invaded by alien sentinel things that swallow you up in Fire in the Sky goo and giant spacecraft which crash to the ground with a nuclear explosion and releasing Cloverfield-like giant hungry aliens. Sounds exciting, right? It isn't. Not even a little bit. Matter of fact, the last 1/3 of the film I just kept skipping ahead to watch basically the same scene over and over again-screaming women, whining, running men...lame. WHY was it boring? well because the writers forget the basic rule of scriptwriting-your characters cannot be reactive, just running and screaming from one menace to another. They have to ACT, man, like John McClane does in the Die Hard films. A powerless protagonist is a BORING protagonist. And with virtually no dialogue, you know, stuff like, 'WTF is happening? Aliens have invaded?' or such, it rings totally FALSE. And, it follows the standard horror film premise of only five people being in the city. Amazingly, in the hi-rise apartment where it takes place, every other tenant (but one) is mysteriously out. Oh yeah, and the black guy dies first. It's like the producers tried to cram every action/sci-fi/horror cliche into one film, hoping something would stick. It didn't. Man I wish I could advise Hollywood on movies-simple stuff like a reactive protagonist which kills the film is easy for me to spot, and easy to fix. It's like I'm the only one who reads books on screenplay writing, and I'm not even a filmaker. WTF man? Truly a stupid boring idiotic piece of dung. My only hope is that somehow all copies of this 'film' get destroyed somehow and we can pretend it never happened. Only one word for the writer, producers and director of this 'film': STOP IT.